Submitted by Gina Asprocolas on Thu, 11/09/2017 - 17:35. 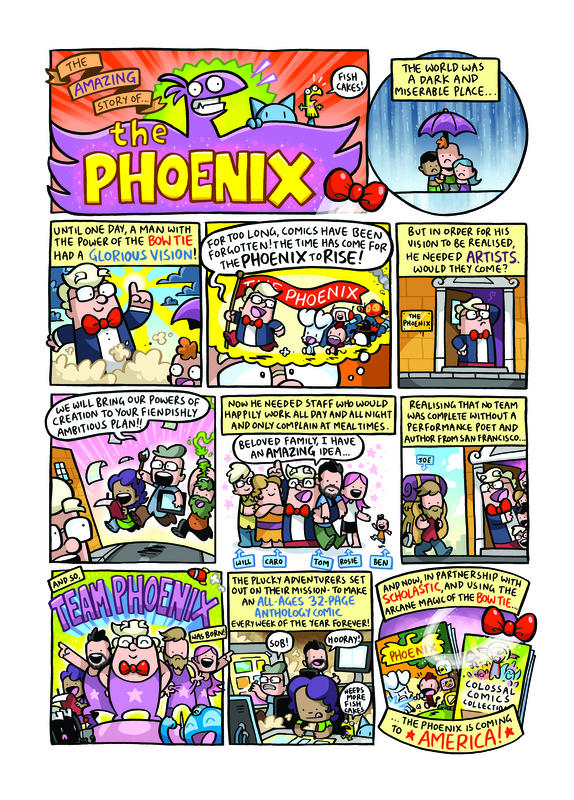 New York, NY—November 9, 2017—Scholastic, the global children’s publishing, education, and media company, today announced the North American launch of The Phoenix, a weekly, all-ages anthology comic to be released in digital editions as part of the U.S. David Fickling Books imprint. 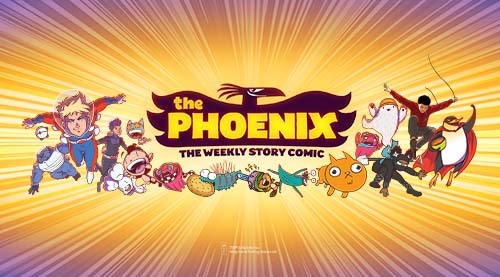 Founded in 2012, The Phoenix has been the preeminent weekly story comic in the United Kingdom, known for its unique mix of serialized adventure stories, humor strips and puzzles. Every issue of The Phoenix backlist is now digitally available in the U.S., and Scholastic will publish each new weekly issue digitally in the U.S. through comiXology. To celebrate the launch, Scholastic is offering issues #1 and #2 as a free double issue download until November 14, 2017. Scholastic is also excited to publish The Phoenix comics in larger physical compendiums which will roll out alongside the digital publication of individual Phoenix comics. These mega-comic bind-ups combine various strips from The Phoenix Weekly to include a variety of different humorous, informative, action-packed, and brain teasing stories in a tailored format. They will be published in paperback at 208 pages, full color, with a 7 x 9 3/4 trim. The bind-ups collect 9-10 individual issues into one book, featuring 6 different strips and giving readers the opportunity to sample their favorites. Scholastic will publish these bind-ups on a seasonal basis twice a year beginning with The Phoenix Colossal Comics Collection: Volume One on March 27, 2018. Click the images below to open a hi-res version in a new window. The Phoenix launched in 2012, and was the first independent comic in the U.K. since 1969 to be free of advertising, featuring only exciting stories and beautiful, original artwork. It has since been voted No. 2 in TIME Magazine’s global list of “Top Comics and Graphic Novels.” The comic recently published its 300th issue in the U.K., making it the first independent comic in over 40 years to do so. The idea behind it is a Mad Magazine for younger comics and graphic novel readers, offering a buffet table of laugh-out-loud, informative, adventure-filled strips. The list of artists and contributors includes Philip Pullman, Neill Cameron, Jamie Smart, Chris Riddell, Laura Ellen Anderson, Rob Deas, James Turner, and Zak Simmonds-Hurn. The Phoenix has been the source of several comics published by Graphix, with contributors going on to publish such works as Bunny vs. Monkey, Gary’s Garden, Evil Emperor Penguin, How to Make Awesome Comics, Mega Robo Bros, and The Adventures of John Blake.